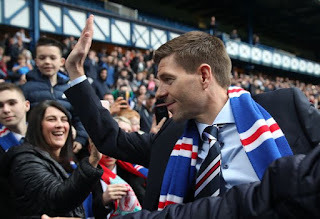 Following Rangers’ confirmation that season ticket sales are now at a higher level than they were last year at this point during a record-breaking renewal spell, it does seem that the signing of Steven Gerrard has simply changed the landscape entirely. A poll on Ibrox Noise did see some divided opinion over whether or not to renew, on the back of the dismal end of the ex-manager’s regime, and it was going to take something seismic to see healthy renewals. Well Gerrard was seismic – and the 30k barrier has already been broken with three days left to go, and up to 15,000 could yet still be sold equalling or even marginally bettering last year’s stunning 45,000 numbers. The capture of the Liverpool legend really has got the senses going – and with the potential recruits such a man at Rangers’ helm can make, and the ruthlessness with which the shoddy current squad is likely to be dismantled make the prognosis extremely positive. The board and Mark Allen pulled off a blinder bringing Gerrard to Ibrox, and fans are buying into the vision. Time will tell if we were all correct to hope and believe, but the proof of the pudding is the continuing record breaking uptake. It looks like it’s work. I was 1 of the people unsure whether to renew, but....I renewed for my son and myself today. Dave King & Stevie G have gave me renewed enthusiasm and hope (expectation is always there). LET'S GO!!! Whether it’s season tickets, paper tickets or pay at the gate, Ibrox will be full every 2nd week that’s for sure. I don’t think the club have anything to fear but no doubt it’s better to have the cashola now upfront, for several reasons. The merchandise, sponsorship, rights deals etc is where I believe we’ll see far better revenue as a result of our Club’s raised profile under Stevie G. Not really had proper retail dosh for donkeys years and we’re talking potentially £5~10M per year. Got to win football matches mind. Nevermind Stevie G, what about yer man Cummings today? Loves the gers despite murty messing him about and is desperate to stay. I think every player should come out with a blue face! Nevermind blue faces , 90% of this squad should have red faces after this miserable season , anyway , onwards and upwards . I disagree it's red faces they should all have. If that’s the standard of player we are signing for next season we have no chance of winning the league. Cummings has shown nothing for me to keep him. An average player in a poor team. SG is surely not signing these players. Sorry I can’t get excited about a player who has scored 1 deflected league goal. Got to be fair to Cummings- he can't score from the bench! Yassss! Stevie G Leading The Charge! Cant wait for the TW and for Next Season! Well I made my decision about a month ago not to renew my season ticket. My son is also not renewing his but for work reasons, but I have not renewed the season ticket I have had now for 31 years, as I really have had the way the club has been mismanaged, poor performances on the pitch, dreadful recruitment of players, staff and directorship, but I stood by all through the dreadful times we suffered recovering from the lower leagues. I know I will miss sitting every Saturday/Sunday/Midweek in the seat I have occupied all through the good times and bad. I hope I regret not renewing my seat. I will attend as many games as I can on a game by game basis and I may even partake in the share issue, although my son and I both lost our shares previously. I do hope Gerrard is a success bringing Rangers back on top and like I said I hope I regret not renewing. Why don't they bring back more, pay at the gate? They are ignoring a large group of people who can't afford the outlay, for a season ticket, but could be filling up empty seats, at games. Never understood this. They'll bring back safe-standing, but NOT, PATG.